This is the essential guide for beginners who are ready to buy their first setup. We look at all of your equipment options and explain everything from cables and speakers, to controllers and digital vinyl systems. Choosing DJ equipment when you're first starting out can be difficult. With so much selection and so many brands to choose from it's really hard to know what equipment to add to your setup. Some of you may just be unfamiliar with certain types of hardware and what it actually does. Others may be completely new to DJing. So this beginners guide to DJ equipment has been designed to help you on every step. We'll look at all of your choices and go through the function of each specific piece of equipment. I'll also give you different options and recommendations based on personal experience. If you are unfamiliar with the different DJ setups you can read my accompanying article to get a good understanding. You'll see diagrams and full explanations with recommendations > HERE. So lets start the beginners guide to DJ equipment with the traditional form of DJing that's still very popular. If you read the recommended article above you'll know that this is known as the traditional setup. We'll look at the turntable first. DJ mixing was born in the 1970's when DJ's discovered that you could use two turntables to blend two music tracks together. As DJing progressed, DJ's discovered that you could use the pitch control on the turntable to beatmatch the records. Beatmatching is the term used for getting two different tracks playing at the exact same number of beats per minute (BPM). Turntables are very basic but they provide all you need to output audio, beatmatch, and to scratch. All DJ turntables feature a powerful motor that keeps the records spinning at the correct revolutions per minute (RPM). The RPM can then be switched between 33 and 45 RPM using a simple touch button. This RPM can then be adjusted more finely to beatmatch using the pitch sliders. The most common DJ turntable was the Technics 1200/1210. Unfortunately Technics no longer make these, but there are some other great options. Manufacturers saw the gap in the market and jumped at the opportunity to fill the void. Pioneer's PLX 1000 that's pictured above is the current DJ's favourite. See my comparison of the Pioneer PLX 1000 and the Technics 1210 when we put them head to head to discover which one is the best > HERE. A DJ mixer is used for transitioning between the two records on your turntables. Many DJ mixers can be very overwhelming to beginners as they feature multiple channels and functions. Extra channels and special functions are nice to have when you become more experienced, but all you really need is basic functions to pull off a great mix. The basic mixer with everything you need to get started will feature all of the following. Also known as the xfader, this is the fader that slides left or right to switch between the two turntables (channels). The crossfader will always be situated in the centre of the mixer at the closest point to the DJ. Crossfaders can eventually wear out, but good mixers will feature a replaceable crossfader. Also known as up faders, channel faders, line faders, or channel sliders. These faders will control the volume of each channel and can be used to quickly cut the volume, They can also be used to fade tracks in/out while keeping the crossfader central. Turntablists will also use the channel faders for cutting and scratching. The EQ functions are used to control certain frequencies of your music tracks. Some mixers only feature a 2 band EQ, some feature a 4 band EQ. But the 3 band EQ is the most popular and will suffice. The EQ panels will usually be situated above the channel faders in a row, they'll be labelled low, mid, and high. The gains are sometimes also labelled as trim, or input. These are basically volume knobs and will be used to set the tracks at the correct volume to avoid fluctuating levels throughout the mix. They will be used in conjunction with the EQ to keep your levels right and to avoid clipping. The gains will usually be situated directly above the EQ panel in the same row as the channel they control. For a full lesson on EQing click here. The VU meters are the lights that jump along to the beat of your music. They are used for keeping your volume levels in check and to prevent audio clipping. A full explanation of audio clipping can be found in the EQ article above. But audio clipping is bad and can damage equipment and ruin speakers. That covers the main features you need to look for when buying a DJ mixer. Mixers will always include other features that will be standard on any brand. This usually includes a master gain for controlling the main output volume. A headphone panel that includes a headphone volume, and sometimes a cue mix. The cue mix is like a mini headphone crossfader that will only fade between tracks in your headphones, and not the main volume. You'll also get various input/output terminals on the rear of the mixer. You'll want phono inputs for turntables, and line inputs for multi players and CDJ's (we'll get to these shortly). The master outputs will run directly to your amplifier or active speakers. Some of you may also want a microphone input, these can usually be found on the back or front. Some DJ's may want a few more features, or the ability to play from multiple audio sources. So next in the beginners guide to DJ equipment we'll look at multi players, CDJ's, and something called a DVS. Check out my hardware section to see some great mixers HERE. Or find the best mixers on the market HERE. Multi players and CDJ's can also be used in the traditional DJ setup with, or instead of turntables. The sources that you can play from will depend on the player you chose and how much you pay for it. Multi players will generally let you play from a variety of audio sources including computers, USB storage devices, and iPads/tablets. Modern CDJ's will let you play from CD's, USB devices and computers. They've been designed to mimic the traditional turntable and work very similarly. They will have a platter that you can touch to stop, cue, spinback, and scratch a music track. They'll also have a pitch slider to adjust the BPM of your tracks to beatmatch. Beatmatching tends to be much easier on multi players and CDJ's because of the BPM counters and digital readout. The features on different players vary and what you get will always depend on what you spend. As you can see on the Pioneer XDJ-700 pictured above on the left, some multi players have a waveform to show you a view of your track. Players usually tell you track info like the name, length, time elapsed etc. And most will feature the ability to create loops and cue points. 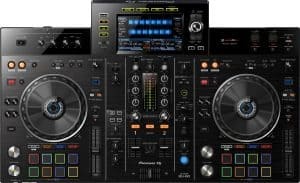 Some people will choose a CDJ/multi player over a turntable because of the extra features on offer, and the ability to play tracks from a computer. But as a beginner you may not be aware that you can also use turntables to play music from a computer. Read on to find out how, or find out all of your options for mixing with using a laptop or computer HERE. A digital vinyl system (DVS) lets you play and mix any track from your computer using just two records. These records are known as timecode vinyl. You can read my post for a full explanation on timecode vinyl and digital vinyl systems HERE. The records will basically send information to your computer about turntable speed, direction, and track position. This makes the timecode vinyl work exactly like a traditional record. So you can mix, scratch, spinback, and cue records in the normal way. If you plan on buying turntables, vinyl prices and finding a place to store records may put you off. In this case a DVS will be a necessity and will save you thousands. See the suggested article above for more. You may be wondering how to set all of this up. Where to plug certain cables, how to link up computers etc? You can find all you need to know in my article - HERE. 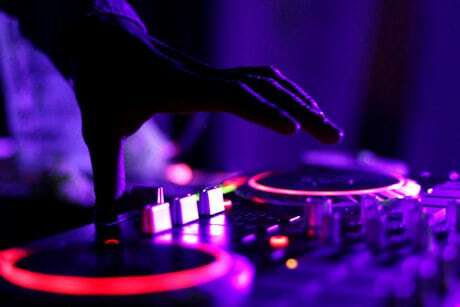 Click on the link and scroll down to - How to set up DJ decks and equipment. The next equipment we'll look at in the beginners guide to DJ equipment is the DJ controller. This way of mixing is probably the most popular choice for beginners, it will also offer great value for money. A DJ controller has become one of the most popular ways for aspiring DJ's obtain their first setup at a low price. If you already have a laptop and speakers you'll be able to simply plug in the controller and begin mixing. Assuming the controller has a built in sound card (most have), this requires no other equipment to start DJing. A controller consists of a mixer in the centre with all of the same controls as a normal mixer. And either side you have your deck section to control the music from your computer. These work just like a multi player, and some will let you plug in USB devices. But they don't allow you to play music from CD's. Controllers are built to work alongside specific brands of software which we will cover in the next chapter. This software will work in conjunction with certain buttons on the controller. You'll see features like performance pads (the colorful buttons on the picture). These trigger things like cue points, effects, and vocal samples, and will be assigned to the pads using the software. You'll also see library search knobs to scan the track library in your software without touching a mouse or trackpad. All controllers vary and the amount of features will depend entirely on the price you pay. Simple controllers like the Pioneer DDJ-RB will be perfect for beginners and offer amazing value for money. I have a full review of this controller HERE. But if you want more features as a beginner you'll want something simple but feature packed like the Pioneer DDJ-RR. 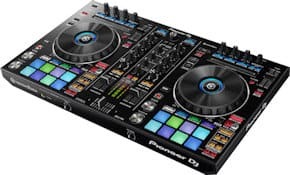 Check the current price on Amazon here -> Pioneer DDJ-RR. Controllers can be great for beginners but also for mobile DJ's that need less equipment to carry around. They offer everything separate players can and at a price that doesn't hurt your wallet. If you're using a controller you'll also need to install software onto your computer/laptop. If you don't want to use/buy a laptop you could get yourself an all-in-one unit. These are basically the same as a controller but you can play tracks from USB sticks and sometimes CD's. You simply plug in a set of active speakers or connect to an amplifier, and you're ready to mix. A great example of an all-in-one controller is the Pioneer XDJ-RX2 which is ready to mix out the box. These are a great option if you don't already have a laptop, and you may save money by getting an all-in-one unit. This makes more sense, rather than buying a standard controller plus a laptop which adds to the overall cost! All-in-one controllers are also a great choice for travelling or mobile DJ's because you'll have less equipment to transport to and from your gigs. At a gig there's always the worry of somebody knocking your laptop off the table or spilling a drink on it, an all-in-one unit also solves this problem. If you want to use a DJ controller, multi players (computer option), or a DVS, you will need to use it in conjunction with software. There are many different programs, but choosing one will depend on your requirements. You can find a list of the top DJ software in my article - HERE. You'll get a full overview of each program and you can even find some for free. Some controllers and software will be sold as a bundle. For example, pioneer sell many controllers bundled with Serato DJ, or Rekordbox. Seratro DJ is recognised as the most popular software and will work perfectly alongside any controller that is mapped to it. Rekordbox is Pioneers own brand of software and will work alongside many controllers, but only works with Pioneer hardware. Bare this in mind before purchasing hardware, it's always best to find your equipment first. If you're buying software to set-up a DVS, serato DJ is a very good choice. If you have a basic mixer you will need a sound card that will run between your mixer and your computer. Some mixers like the Pioneer DJM-250 MK2 that I reviewed here, come with a sound card built in. This will work just like a controller and will let you to plug it straight into your computer. If you do need to buy a sound card the Denon DJ DS1 comes as a package that includes all of the DVS gear. So it includes a sound card (also known as an audio interface), two timecode vinyl, two timecode CD's, and the full version of the software. This works out to be the best value for money when first setting up your DVS. Bare in mind that the full versions of most DJ software doesn't include DVS control. If you buy a sound card that doesn't have a full version of the DVS software you may need to buy a software add-on. By now you should have a better understanding of each piece of equipment required for a DJ setup. But the setup is no good without something to amplify your music. So next in the beginners guide to DJ equipment we'll look speakers, headphones, and amplifiers. Your headphones will be used for beatmatching, EQing, and mixing. They will plug into the front of your mixer and be controlled by the headphone panel on the top/front. If you don't know exactly what to look for in DJ headphones check out my essential article here. This article will tell you everything you need to know! No beginners guide to DJ equipment would be complete without talking about the sound system! Your mixer will have master output terminals on the rear, this is where your speakers or amplifier will plug in to. The master output volume knob will control the main volume of your room. 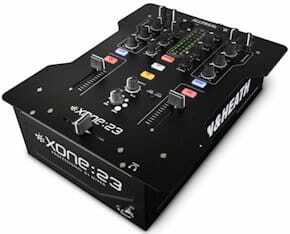 Some mixers will also feature a booth output, this is something that mobile, or club DJ's will need. This will include a separate volume knob on the mixer, so that the booth can be controlled separately to the main room volume. Mobile/club DJ's will use the booth output to control the volume of separate speakers in the DJ booth, these are known as monitors. These are used because speakers can be a long way away from the DJ or facing away from the booth. Speakers might still seem close enough, and are still loud, but the sound reaches the DJ a split second later than it's leaving the mixer. But the sound you're hearing in your headphones is reaching your ears instantly. This can play havoc with your mixing. So monitors are always recommended in any situation where long speaker cables are used. Or where the speakers are facing away from the DJ booth. Not all mixers come with a booth output, so if you think you'll need one bare this in mind. Active speakers are speakers that have an amplifier built in, these will plug directly into your mixer. They are perfect for home, and mobile DJ use, and offer the best value for money. All you'll need are cables with plugs that correspond to the terminals on your mixer, then you can simply plug and play. I always recommend active speakers to all DJ's because of the simplicity and the value for money. And you also have less cable mess to cause a trip hazard at home, or at a gig. Check out my hardware section for the best speakers and monitors on the market HERE. Passive Speakers are different from active speakers as they draw their power from an amplifier located outside of the loudspeaker enclosure. Passive speakers are usually much lighter and cheaper than powered speakers, but if you use them for your setup you'll need to buy an amplifier. This kind of setup is recommended for mobile DJ's with large sound systems and venues, not so much for bedroom DJ's. Amplifiers are great if you need extra power for big sound systems, or for a larger number of speakers. The cooling fan can make them a noisy addition to home setups, kind of like a noisy computer fan, but much louder! And they really aren't needed unless you have a massive sound system. So beginners setting up their first sound system should stick to active speakers. The ones I've used at home for over a year now are the Pioneer DM-40 and I love them! (Update) I recently got myself a pair of Behringer B210D Eurolive speakers, and wow! They are probably the best speakers I've ever owned, the sound reproduction is amazing. You can check them out on Amazon here -> Behringer B210D Eurolive. The reviews say it all! Mobile DJ's will like the Pioneer XPRS15 speakers. The '15' stands for 15 inch woofers. 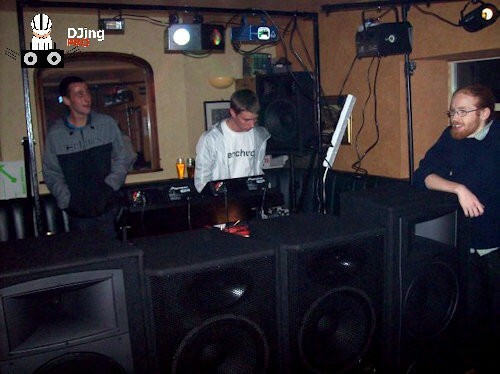 I used 15" speakers for my old mobile DJ system HERE, and they were great for medium to large venues. For full advice on setting up amplifiers and active speakers see my article HERE. And scroll down to How to set up DJ decks and equipment. When it comes to setting up your equipment you'll need lots of cables to connect it all together. You'll find various plugs and connectors, so you'll need to know what they're called so you can buy the correct cables. An RCA connector, sometimes called a phono connector or (in other languages) Cinch connector are very common on DJ equipment. They're commonly used to carry audio and video signals and will be used on controllers, mixers, speakers, audio interfaces, turntables, and multi players. They're cheap to buy, but you'll need to specify whether you need a male or female connector. When connecting be sure to connect the white plug to the white socket and the red plug to the red socket. The Speakon is a trademarked name for an electrical connector originally manufactured by Neutrik, so you may find them labelled as Neutrik Speakon. Other manufacturers make compatible products labelled as speaker twist connectors. 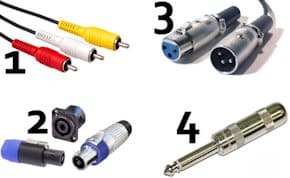 They're commonly used on speakers and amplifiers, you can also find them used for microphone connectors on mixers. They feature a locking system that makes them great for using during gigs when cables could accidentally get pulled on, the locking system prevents them from being pulled out of the socket. XLR connectors are primarily found on professional audio, video, and stage lighting equipment. You'll very often find them on the balanced master out connections of a DJ mixer to reduce unwanted electromagnetic interference. A smaller version, the Mini XLR Connector, is used on smaller equipment. XLR connectors are available in male and female versions and also contain a locking mechanism to prevent them from being pulled free of the socket. Jack plugs, also known as a phone jack, audio jack, and headphone jack can be found on lots of DJ equipment. They're commonly used on speakers and microphones, and always found on DJ headphones. They're available in many different sizes but the sizes usually found on DJ equipment are 1/8" (3.5mm) and 1/4" (6.35mm). Many mixers have a 1/8" and 1/4" socket but some mixers only have one socket so you may need a readily available adapter. When you start gigging you'll need to pack a gig bag so that you're ready for anything a gig could throw at you. Breakdowns eventually happen to all of us and there are a few other things to be aware of and essential equipment you'll need to pack. You'll need a tough well built bag with lots of different pockets so you can find exactly what you need fast. The Magma Riot is specifically designed for working DJ's and will tick all of the boxes, check it out on Amazon > HERE. Go over to my gig list post to find out every other essential item you'll need to pack in your bag and why > HERE. That concludes the beginners guide to DJ equipment, thanks for reading the guide. Once your setup is complete you'll be ready to start learning mixing and blending skills. 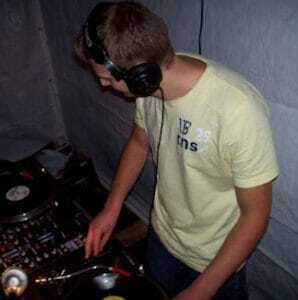 Check out my DJ mixing article - HERE. And for all of the top beginner DJ tips go > HERE.